I had let the battery run down by having the lap top on charge for too long, although great to be able to have caught up on matters communications, a bit of a pain bump starting Batty. Luckily we were on a hill and it was not a problem, but that fear of it not starting is quite intense. 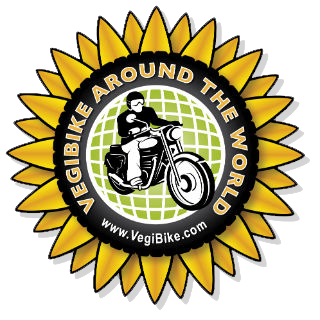 A few miles down the road and short on fuel, I stopped to buy 8 liters of veg oil at the Penny store, a chain of supermarkets, now I am pretty blind to the odd looks I get when that is all that is in the basket. I had parked Batty at the entrance, which was also a garage forecourt. It takes a bit of a time to empty the bottles into the tank and I have learnt to take the fiddly tops off in advance which does speed things up a bit. Anyway it does attract attention and the pump attendant, yes they still have them here, came over to see what was what. He laughed and laughed, which got only louder when I could not start her. Eventually the kick start worked and all was well. To give him his due, he did offer to push the bike to bump start her. An old lesson re-learnt, don't stop the engine for at least 30 mins when the battery has been flat. One thing I have noticed is the proliferation of solar panel farms here. There are a lot and it would be interesting what proportion of their energy comes that way. UK is way behind. This resonated with a discussion Humphrey and I had at the weekend, he has a long proven and successful track record of investing early on in all matters technology and the like, he is of the view that Sun energy will win out over all other energy forms as the panels become more efficient, from the current 15% to 40% and even 60% over the next 5-10 years. Which combined with an annual 20% drop in production costs, makes it compelling. The holy grail is storage of energy, and that is what the boffins are intensely working to crack. There is promise that mass and efficient storage is not far away. He imagined a world with hardly any power cables scaring our landscapes as most energy needs are created locally. Talking of energy, the last fill up was on 1/3 to 2/3 veg oil, and all seems fine. Today I will switch to 1/4 diesel and see if I can standardise on that. Having sat outside the DHL office from 2 till 4pm in Foggia, waiting for it to open after the very generous length of lunchs they have here ( in fact had a long lunch myself... and devoured a few more Neville Shute pages). When it didn't, I translated the rest of the message on the window, with my iPhone app, which said that they were closed all Thursday afternoons. So plans had to be changed a bit. Bloody SIM card, why does the law of sod say that I will never need it? Found a local shabby hotel room, as the nearest campsite is an hour away it has a very single bed and a view of a wall. My needs are modest, and it has turned into a clothes washing opportunity. Alas no Internet. But what do you expect for €45. As I have driven further south in Italy, there are 2 economic indicators that have become apparent. The first is that I have seen no Ferraris south of Milan, but loads north and the second, much more importantly, is that the further south Batty has been over taking cars almost regularly, twice yesterday, and 3 times today. Ok so they are quite slow cars, driven by somewhat elderly folk, but even so I can feel her gusto swell as we sweep past. I will keep these indicators going as more of the world greets us. SIM cards don't come easily, but at 12.30 it had turned up, having been at another depot. The DHL chap was v helpful and spoke pretty good English. On Southward and have a less twisty route, putting up with the odd juggernaut. They seem less violent somehow down here, maybe I am just getting use to them. 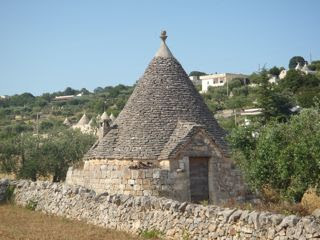 Much my joy I came across lots of Trulli buildings, I wasn't sure where they were in Italy but knew it was southern. Having read about these funny shaped houses that are the things of fairytales, there are thousands south of Bari. Now in the heel of Italy and the port of Brindisi only an hour away, I am hoping to get a ferry to Petra in Greece tomorrow evening. Harry you really are moving on Greece ! And sounds as if your fuel mix is now working well . Be interesting to see how the roads are on the next leg of the trip.